And it began to cook. And it began to smell. “Jesus Christ, there is NO WAY, I’m tasting that,” Tristan shouted. The smell got worse, perhaps mixing with eau de fermented mudfish. “It smells just the way a cooked [uterus] probably should smell,” he cried above the hiss of the oil and the mass of sizzling pink-grey tubes. The author proceeds to put the entire dish in the trash and then take the trash out after the cat showed too much interest. Now I was worried. I had to assume the taste would not be to my liking, so I’d need to surround the pig uterus with heavy tastes that I already enjoy. My weapon of choice would be curry made from coconut cream. 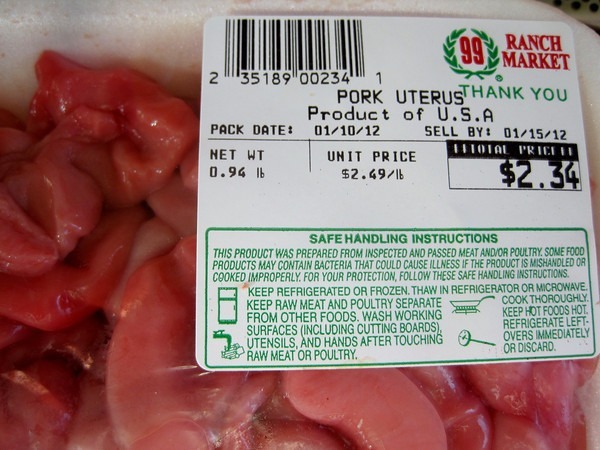 Summary: Hiding the taste of pig uterus in a Thai Curry. Be sure to chop up uterus meat. Saute onion in oil (I used coconut oil). Add curry paste (as much or little as you want). Peel and dice yam. Put into curry. Cut uterus into bite sized pieces. Never thought I’d write that sentence. 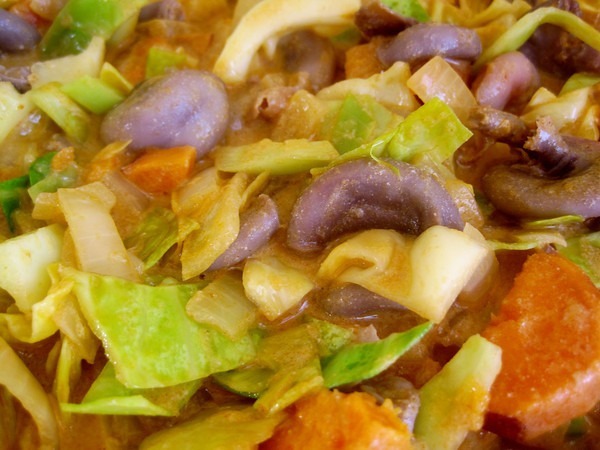 Once the yam is soft, put in the cabbage. After a minute or two, add in the pig uterus. 1. Season (and rub) all surfaces with salt and rinse. 2. Quick blanch (30 seconds to 1 minute) and drain. 3. Also, you did overcook it. Cantonese cuisine usually uses a quick stir-fry technique in a wok or drop into ready-to-eat congee (rice porridge). Bottomline: don’t cook for over a minute. @Terri – Thanks for the tips. I still have 1/2 pound left. Round #2 next week! …and here I was thinking the uterus was just muscle meat. 🙂 Kidding, MAS that was a bold call at the market. For some reason the combined effect of your photos and your description of the meat have me thinking that the uterus had the shape and texture of calamari rings. @Teri’s suggestion to not cook it for over a minute also sounds similar to the standard instructions for calamari. Naturally the color is different (as I suspect was the flavor), but was their any comparison between the two? @Geoff – It did taste slightly like overcooked calamari, but more like chicken hearts. I only slightly overcooked mine. The recipe fixes it, by moving the cabbage ahead of the uterus. I found that the tubes (fallopian) contained a puss-like ooze that had a foul smell. I cut the tubes lengthwise with scissors and washed out all the puss stuff. After salting and blanching, they were much less smelly. @Rob – Thanks for the tip. I was getting ready for my 2nd attempt soon. 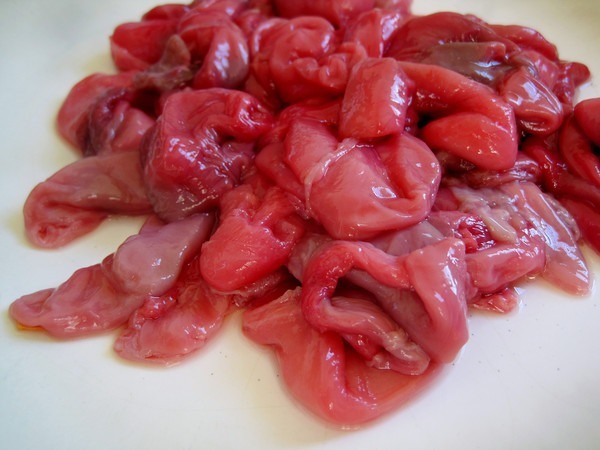 Just received some Pig Uteri from a friend who has a great knack for choosing birthday presents; I am now compelled to eat the things and trawling the net for recipes doesn’t prove fruitful. The general consensus is they stink. I am filled with wonder and fear. Wish me luck. @Robin – Post a comment if you can figure out a way to make it taste decent. Good luck! It is loaded with everything bad but soo soo very worth it… It’s high in cholesterol, uric acid and fats fats fats. This dish wil guarantee you a good nights sleep with bad dreams…but nothing will make you feel as good. The pork uterus in congee is tied in a knot (like the banana flower in stews) and served to pregnant or lactating women for female health benefits. Probably the idea of eating a placenta that’s delicious and comforting in a congee. It’s served in fajitas too instead of the normal meats. It can also be grilled til it’s almost crisp. Or barbecued til it’s golden brown. It has to be done in a skewer with the uterus looking like a kebab. 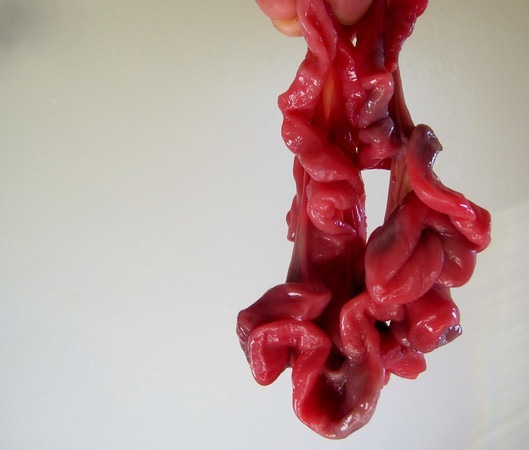 The pork uterus is still a mesmerizing dish after you’ve had one too many. You’ll either die of heart attack, suffer bad health or eat a dirty one and altogether give up on it. But you’ll still say it tastes better than fish guts. @Thumbelina – Thank you very much. I wish I had your guidance when I first tackled this unique food. @Rd – Thanks for the tips! A friend if mine visited his girlfriend’s home in northern Thailand. The father worked at a pig slaughter house. He brought a bag of pig uterus for dinner. Mum cooked in a wok with Thai ingredients including chillies of course. He claims it was a great dish! I’ll stick to the pig on the spit when in Thailand!